Typically the Russian gingerbread known as pryaniki take a week and specialized equipment to make, but this shortcut version is a good option for home cooks. 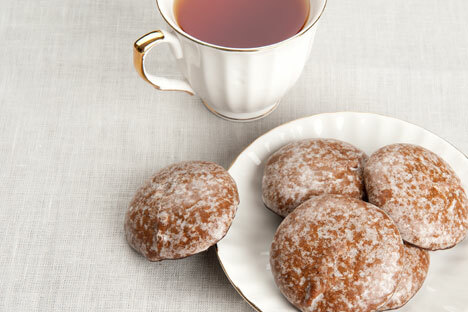 Pryaniki are a Russian version of gingerbread. They come in different shapes and flavors (mainly vanilla, chocolate and mint with various fillings), but the most famous type are made in a small town out of Moscow called Tula that’s also famous for being the home of Tolstoy’s estate and one of Russia’s most famous gun manufacturers. So naturally there you can buy gun-shaped pryaniki there – or, really, any shape you can imagine. Many have different sayings on top and a filling made from either jam or boiled condensed milk. They are always covered in delicious and very pretty glazing. My modest research shows that they are adored by all children in Russia and are the kind of thing you buy at the store rather than make yourself. I think parents like it that way. Most recipes for pryaniki are incredibly long and complicated and include lines like “leave dough for 5-7 days to sit” before requiring a special type of oven and other equipment to bake and glaze them. This process allows the dough to get that uniquely dense yet crumbly consistency. There is however an easy way to make pryaniki (otherwise I would be quite unlikely to be writing this) – they turn out very nice and with a lot of honey flavor, and take very little time to make. They aren’t the same as the ones from Tula, of course, but I think they make for a great homemade option. I’ve made them in a cooking class with kids and we wrote words and sentences using the dough which was really fun. You can also make a caramel glaze by simmering water with sugar to brush over the dough to make it prettier. 1. Mix the eggs with the sugar. 2. Heat honey and butter over a low burner and let cool, then mix with eggs and sugar. 3. Combine the flour and baking powder. Add to the dough. 4. Mix in spices and nuts to taste. 5. Cut dough into pieces, roll out and shape. 6. Bake for approximately 15 minutes at 200C.